Marduk show in Oakland cancelled "in the interest of safety"
"In the last week we have read interview after interview with Marduk spanning over the last 20 years and found no statements indicating the band are white supremacists, nationalists, or anti-immigrant. That being said, we don't want to subject our security staff, venue staff or the public to violence. Our staff is almost exclusively POC and/or LBGTQ and they have all expressed the desire to work, but as we are getting threats, we just can't risk it. So, in the interest of safety, and because the Oakland Police Department would have insisted anyway, we have canceled the Marduk performance on Feb 18. 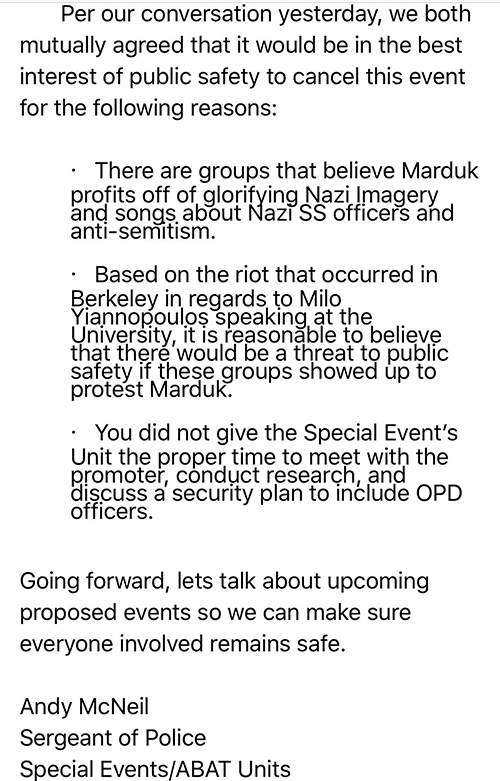 "The Oakland Police Department has decided in the interest of public safety that the Marduk show on Saturday, February 18 at the Oakland Metro Operahouse be cancelled. Refunds at point of purchase. We apologize for the inconvenience." • Marduk, Incantation, Svart Crown to tour U.S.